Published July 23, 2013 By Anna T. This post may contain affiliate links. Regardless, I only recommend sites I've researched and/or used and trust. I have received a couple of messages this year from people looking for online jobs for teens. Some of these people actually were teens, and some were parents of teens. If you are a teenager or if you have a teenager, I have some solutions that will help! Most of these things are just good for extra money online, but some money is certainly better than no money! Especially if you're without a car and wouldn't have a way to get to and from a part-time job outside the home. The list is below! And if you like this kind of info, please consider becoming a newsletter subscriber and/or following my Facebook page to see more of it. I send out new work at home job leads and work at home updates weekly. Slice the Pie is a website you can use to rate and review music. You can sign up at 13 and older. Simply listen to a clip of a song — most of the time by a newer artist — and give it a 1 to 10 rating along with four or five sentences explaining what you liked or didn't like about the music clip. Pay for each music clip you rate varies. Sometimes I get as much as .18 cents and then other times it's down to 7 cents. Slice the Pie occasionally has special promotions where you can earn more for rating songs. They pay out every Tuesday and Friday with Paypal. You must have at least $10 to request your money. Read my Slice the Pie review or go here to get started. Fiverr is a huge marketplace where people post services they are willing to provide for $5. Teens are allowed to sign up and post services here. Fiverr actually has potential to turn into more than just side money, so that makes it one of the best online jobs for teens. Many people do make their living from Fiverr, earning thousands of dollars per week. If you're wondering what services to offer, just take a look at what other people are offering and see if you can do something similar. Fiverr pays you with Paypal and after all the fees, you will receive almost $4 for every $5 order you receive and complete. Read my Fiverr review or go here to sign up. U-Haul is a well-known company (I'm sure you've heard of them) that occasionally has work from home customer service type jobs available. 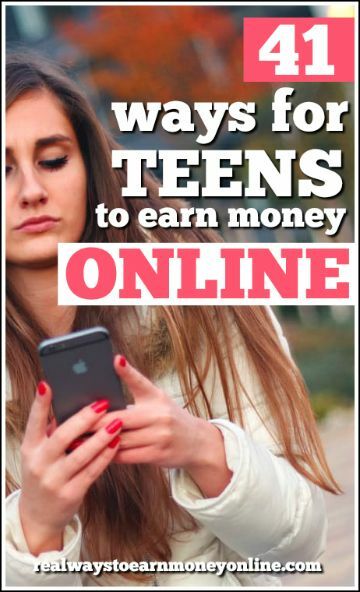 This is definitely one of the real online jobs for teens, and not an extra money gig like most of what is listed here. The majority of the work from home customer service jobs I come across require that applicants be at least 18 years old, but U-Haul hires workers that are as young as 16! You can read my review of U-Haul work from home jobs or go here to check and see if they have work from home positions available now. Etsy is an online marketplace for all things handmade and vintage. You can open up a shop on Etsy with your parent's consent if you are under the age of 18. However, your parent or guardian will have to additionally be the one who manages your shop. You can read my Etsy seller review or go here to sign up. If you're at least 18, you can register yourself on Rover.com and get pet-sitting jobs in your area. Most people who are sitters on Rover say their first job comes within a few weeks or less after getting signed up. While Rover focuses on dog-sitting, you can get gigs taking care of cats and other animals as well. Pay is fast — once your service is complete, you can withdraw your earnings from your account. You can read our Rover review for more details or go ahead and get started here. YouTube is an option if you like the idea of making videos and posting them online. Many teens have been successful with this. People who make YouTube videos typically earn from the ad revenue, so the more your videos are seen, the more you can earn. There are some helpful hints on Quora regarding earning money from YouTube as a teen if you want to check them out. Teens can take online surveys for money for different online survey panels. Many, many online survey panels do permit you to sign up as long as you are at least 13 years old. Note you must have your parents permission if you're under 17. Like most of the other online jobs for teens, this is money that is slow to build up. But the more survey panels you are a member of, the more survey invitations you should receive. Doing surveys here and there as you receive them can certainly add up to extra money in a month's time. Below are some of the better panels out there that allow users to sign up at as young as 13. See even more sites like the survey panels above on Extra Cash & Rewards, an entire site dedicated to them. Reward sites are similar in a way to survey sites because it's something you can do here and there to build up cash and rewards over time. These sites usually have a mix of different things you can do to earn — search the web, redeem offers, answer surveys, watch videos, and several other things. Most of them also pay in points. The more you participate, the more you can build up. The points can usually be redeemed for not only Paypal cash but also various merchandise and Amazon gift codes. Here is a list of some of the more popular reward sites you can begin using as a teen. And remember, this one is just extra cash. Swagbucks – 13 & up – read my review of Swagbucks here. Earning Station – 13 & up – read my review of EarningStation here. InstaGC – 13 & up – Work at Home No Scams has a thorough review of how InstaGC works here. If you're at least 18 years old, you can get paid to deliver food orders for DoorDash in most major locations across the US. Most people who work for DoorDash bring in at least $10 hourly, plus it is very flexible so you can do this when you have time — working it around school hours or any other job you may have. You do need to be eligible to work in the United States and have access to an Android or iPhone. Learn more about how DoorDash works or go ahead and get signed up to work here. This is a newer online tutoring site that lets you sign up to tutor people in virtually any subject. You do not need to be a professional and you can sign up at as young as 15 years old. So if you are a teen or know a teen that has vast knowledge in a subject that could be taught to others online, this might be a good idea. Go here to sign up for Enroll. Qmee is a browser extension that you can install on pretty much any browser (Chrome, Firefox, etc.). Once installed, sometimes Qmee will show sponsored advertisements on the side when you're searching on any popular search engine. Each advertisement will pay a certain amount (usually a few cents or more). If you visit any of the ads you see when they pop up, you'll get that cash into your Qmee account. They will pay out instantly to Paypal no matter how much is in your account. Qmee is open to people ages 13 and up in either the US or the UK. Go here to sign up for Qmee, or read our review to learn more about what Qmee is. There are a handful of direct sales opportunities that are open to teenagers as well as adults. Keep in mind that while these opportunities make it possible for you to earn money as a teen, there is still an upfront investment to start. These companies typically require you to purchase a starter kit of items to help grow your business. However, you will begin earning commission on your sales after that. Avon – Makeup. Eligible for teens 13 & up (cheap to start at just $25). Origami Owlettes – Jewelry. Must be between the ages of 12 and 17. NuSkin – Skincare. Can sign up at 16 or 17 with parental consent. Gel Moment – 16 & up. Skin care, nails, etc. Perfectly Posh – Skincare. Open to teens 13 & up, but you must contact their support number if you're trying to sign up under the age of 18. This is a mobile app I'm trying out where you can spin a wheel to earn money. There is no age limit to play, although the terms say that you may require parent or guardian consent depending on your local jurisdiction. The way it works is you earn spins by watching short ads within the app. Every spin is a chance to win up to $5. Obviously most of the time, you're not going to win $5, but your earnings can accumulate over time so that is becomes a source of some extra cash here and there. Go here to check it out. If you sign up, feel free to use my referral code – 107408. If you're a teen with stuff to sell, consider looking around on Facebook for some local yard sale groups. You can join and then post your used video games, electronics, or anything else you might want to get rid of. This is a good option because there really isn't an age limit. However, definitely use caution and don't meet anyone in an isolated place alone. If you are not yet driving, have a parent or guardian drive you to meet the person you are selling to. We have some more info on using Facebook yard sale groups here. You'll notice some of these online jobs for teens pay out with Paypal. It is possible to get a Paypal debit card if you are under 18. You'll just need to ask your parents to sign you up for a Paypal Student Account. It's pretty obvious that most of the online jobs for teens and side earners don't typically pay all that well. I would suggest combining these to maximize your overall earnings. Do as many as you have time for. Sell It, Trade It, or Get It Free – a Young Person's Guide to Making Money Online is a really good, useful e-book that may provide some more help. I read through this one several months ago and was very impressed by the ideas it had for young people to earn extra money. When you're searching for online jobs for teens, be mindful that internet scams are everywhere. Try to screen what your teen is doing online to make sure they aren't getting taken in by one of the many scams floating around. Stay as involved as you can. I think Fiverr® is very good option. I use fiverr and it is awesome. Earning $5 + for doing to simple project is really helpful to earn part time. Other than fiverr I work on swagbucks and survey savvy. Nice article for students. Great resources. If you’re a teen, you’ll have to make sure that you’re old enough to participate on these sites. Fusion Cash used to accept teen, but I’m not sure if they still have the same policy. If you have any computer skills, I suggest you do some freelance work on sites like Odesk and Fiverr. You have to get your parents to register on your behalf. This is a slightly different opportunity from the others listed, but a very real opportunity none the less! My 13 year old step-daughter has been doing this since year & loves it! Not only has she made quite a bit considering the little time she has to dedicate to it, but is already learning so many important job/career related skills. A couple important things to consider…. -A parent/guardian will need to join with their teen to at the very least oversea everything. -This opportunity is not limited to internet business only, however you can CHOOSE to work this 100% online & still be successful. The program is Origami Owl® for young women (ages 12 & up) called the Owlette Ambassador Circle which was inspired by Bella who founded Origami Owl at the age of 14, to help other young entrepreneurs. Now our young future leaders can learn the valuable skills of being an entrepreneur, building a business, developing customer relationships, and providing customer services. Monthly webinars are held and recorded, focusing on topics specifically targeted at our Owlettes. Leadership, communication, social media, and other valuable business-related sessions to build their knowledge and skills for future success. They will work under the direction of their legal guardian and learn the technology and operational skills to be successful in running their own direct sales business. I’d be more than happy to provide more info on request! Is this legit I don’t want to get riped off. It’s all legit. I have either researched or tried out everything listed here. I need to share this with my teens! Thank you for a great list to get them started! Are any of these websites legit? I see a lot of the surveyonline websites and 90% of them always are written by the surveries themselves…would be nice to find actual customer reviews of these websites. There’s so many fake websites popping up and commentators just made by other bloggers promoting their websites. One big heap of time-wasting and scam-bringing. I use swagbucks and from what I’ve seen it’s legit, though I haven’t tried to get a giftcard or sent to my paypal yet. So there is this app named featurepoints. It is an app which you can make money by downloading other apps and testing them out. For each app you download you will receive points, these points can be exchanged for rewards. Rewards do differ depending on your country but these are the main rewards you can receive: various paid apps, iTunes and amazon giftcards, payments into your paypal, an iPad mini. If you do download it, please use the referral code RY6TM4 and we’ll both get extra points! Great Post ! I gotta show this site to my lazy brother-in-law who is 19 on summer break and refuses to get a job but spends most of his time on a computer. Thank you very much Anna. My son and I were just talking about how he should be trying to earn some money online yesterday. The paypal tip is great! I sent him an email with this post. Thanks for all you do. You’re welcome! I hope the things he tries work out for him! Don’t forget YouTube! Although you need an Adsense account a parent could set all that up for them. YouTube is huge with kids and if they can be funny or just interesting or have a talent (makeup and hair is big) they could do well with it. Thanks for the list, Anna. Although I turned 18 nearly three years ago, I appreciate this list and wished that I could’ve seen something like this when I was still 17. Maybe I should email this to my cousin. I had no idea Paypal had a Student Account. I knew about the Paypal debit card, but had no idea that you could get something like this even when you’re under 18. This is a great list for teenagers and also for international freelancer especially the revenue sharing sites. Is there by any chance a post was already written about work-from-home jobs for non-US resident freelancer? I don’t think I have one, unfortunately. Are you in Canada by chance? I do have a post with lists of work from home jobs in Canada. I’m from Canada. I have collected some posts mostly from realwaystoearnmoneyonline in Springpad. I thought of the international freelancing opportunities because I knew that freelancing is becoming the main source of income in other countries. I’ve been following your blog and recommended your blog to a freelancer from Asia. She even found a few gigs.